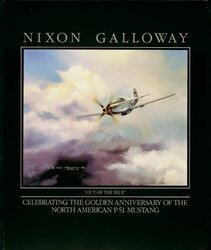 Nixon Galloway was an experienced professional who was well known for the broad scope of work he had produced for corporations and advertising. 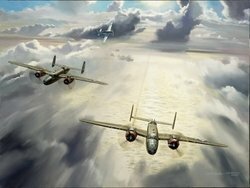 His paintings have been exhibited in the White House, Smithsonian Air and Space Museum, the Air Force Museum, and the Kennedy Space Center. 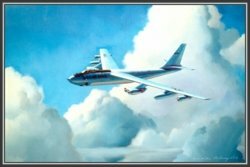 For many of those years he worked as a freelance illustrator with clients such as Boeing, Hughes, NASA, Northrop, Allied Signal, American, Hawaiian, Continental and United Airlines. 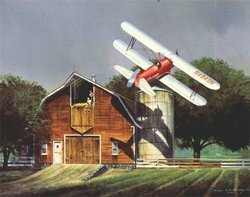 Two notable series that you may have seen were the UNITED AIRLINES COLLECTOR SERIES (42 paintings) and the WINGS OF AGRICULTURE calendars. 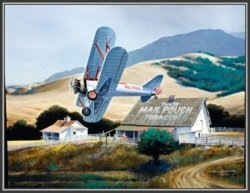 (60 paintings on the history of crop-dusting). 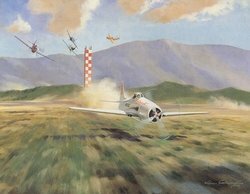 He has been President of the Society of Illustrators of Los Angeles, and is a graduate of Art Center College of Design. 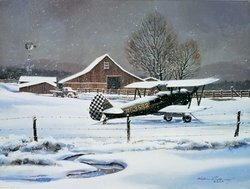 He was an Artist Fellow member and a past president of the American Society of Aviation Artists. Nick passed away on January 27, 2003.